My husband has just returned from his annual camping trip with the boys. They spent almost 10 days in the arid region of northern Nevada trying to catch the very narrow window of good weather between bitter cold and scorching heat. I have joined him on this camping trip in the past (I’ve shared some images here from previous trips) and when the timing is right, the high desert hills are teeming with life–wild horses, wild donkeys and wildflowers of all colors. Exploration using ATVs and motorcycles are the main draw for my husband’s friends but for him, it’s the guaranteed solitude (no one else around for many miles), the beauty of the landscape and the hot springs that draw him each year. When my husband returned home yesterday I was given the highlights of the trip over some wine and cheese. I’ve heard many of the stories before of rattle snake sightings or of the elusive big horn sheep and even riding alongside a herd of pronghorn antelope–he’s taken the same trip for decades, long before I became a part of his life so some events seem to carry over from one year to the next. This time, however, he regaled me with a different sort of adventure. On their second night at camp 30 mph winds blew over the desert. My husband was preparing to retire for the night when above the howling winds he heard our friend’s curses outside. My husband stepped out to see a pile of nylon and plastic rods in shambles; our friend’s brand new tent which was guaranteed to withstand even worse conditions became a near-casualty of the force of the wind. Apparently it took some time to reassemble it into a suitable form of shelter once again. The following night the winds paid another visit. This time my husband stepped out to make a late night pit stop only to find our other friend and his son struggling to reinforce the roof of their tent trailer. The old pop-up’s roof collapsed (no one was hurt) but it was no match for the winds either. It took several pairs of brawny hands to secure the roof that night and I’m still amused thinking of the unfortunate fate of that tent trailer by the end of the trip but that is a story for another time. And what did I do while husband and friends collected stories to tell around the campfire for next year’s trip? I worked, exercised, caught up with friends and I made this sorbet. This was the extent of my kitchen efforts while I was alone. Cooking for one is not as fun for me so simple salads and the occasional takeout dinner sustained me for over a week. I had a pineapple ripening on the counter with a lone banana so I put them together in this sorbet. I added just a bit of sugar to help the already sweet fruits and I thought the latter would lend a bit of creaminess. The blender did all the work puréeing the mixture into a smooth liquid–I did not even bother to strain the mixture but I would recommend you do this. I added some Cointreau to make the sorbet more scoopable after churning it in the ice cream maker and I was very happy with the results. This was my welcome back dessert for my husband and our friend when they returned exhausted from their camping trip. I’d say they were quite happy with it, too, and with two quarts of this sorbet in the freezer, there was plenty to go around while I heard the rest of adventures from this year’s camping trip. There are only a few days left in the Le Creuset Pairings contest. I would appreciate your votes by “liking” by image on Pinterest! Please click here for the link. Thank you! 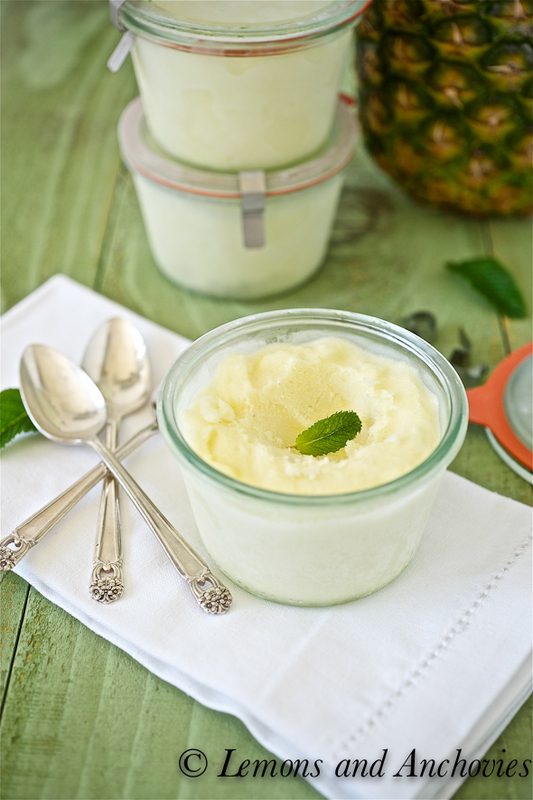 This simple sorbet with fresh pineapple and banana captures the fresh flavors of a tropical summer. Add the pineapple chunks, banana, sugar and lime juice in a blender until very smooth. You may have to do this in batches like I did. Taste for sweetness and adjust add a bit more sugar if you feel it needs it. Strain the mixture in a large bowl and chill in the refrigerator for at least 3-4 hours before churning in your ice cream maker. Before processing in your ice cream maker stir in the Cointreau. Process according to manufacturer's directions. Chill until frozen and serve. Makes two quarts of sorbet. One pineapple will make about 4 cups but I had extra fresh pineapple making for a larger batch here. For one whole pineapple, you would only need about ⅓ cup sugar, half the lime juice and half the Cointreau. I would still add the entire banana. As for your husband’s adventures, I think camping trips lend themselves to some of the most memorable vacation stories! I remember a summer camping trip long ago that was cut short by almost torrential rain storms. We finished out the rest of the week in sunny Napa Valley (I probably preferred that!). Hi, I’m a new reader and I love your blog already! 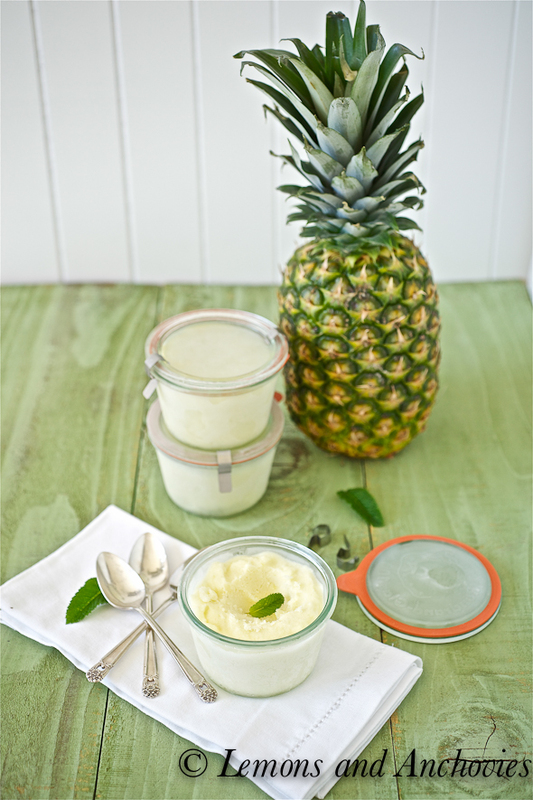 This pineapple sorbet sounds amazing, but what I’m really curious about are those wonderful jars – can you share where you got them? What an adventure, Jean! Thank you for sharing! Your sorbet look fantastic, and sound like I would enjoy it over this summer break! 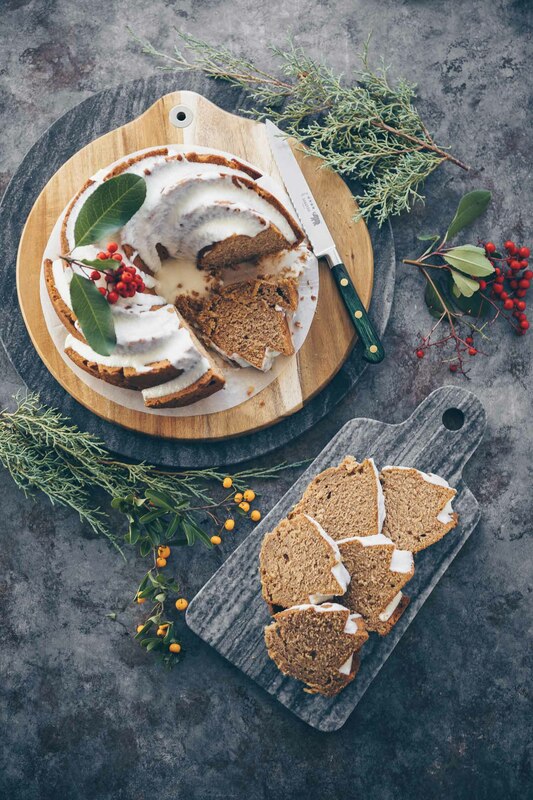 Great recipe, and beautiful photos as always! I think my camping days are over but I hopefully have many more sorbet making days ahead of me, so I really appreciate your recipe;-) Hope you have a fun holiday weekend planned! Always nice to catch up with friends, and let the boys have their time. But always nice when they come back home and you get to hear all about it. Sounds like they had a great time. 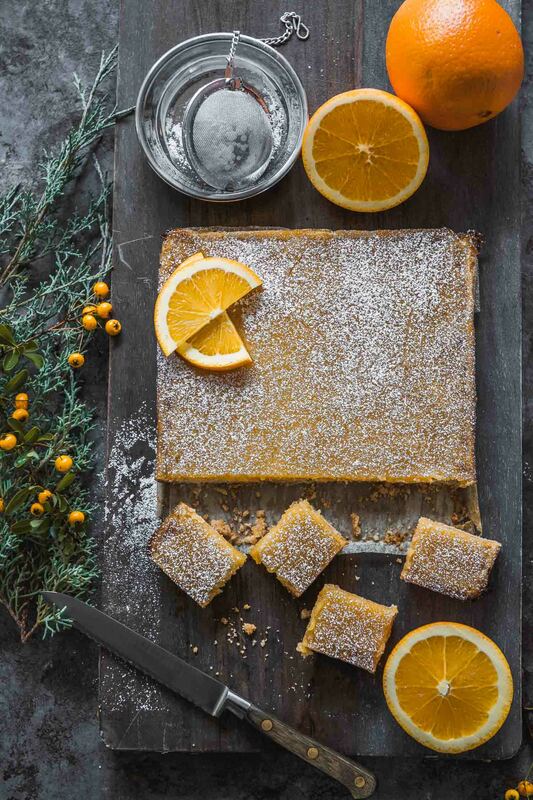 I love anything with pineapple, this looks delicious! Men and their trips…sometimes I wish I was able to be a part of it and other times I thankful I’m not. The sorbet sounds delicious. What a gorgeous sorbet! It looks so refreshing. I agree, cooking for one is nowhere near as much fun as cooking for other people, so when my fiance goes away with work (he’s in the army), I live on simple meals and lots of soups. Perfect! I happen to have a lot of pineapple in the fridge. WIth temperatures in the 90s already this would make a great Memorial Day dessert! Glad everyone is okay. At the very least, there are new stories to tell! Oh, that’s so nice that your husband get to go on his camping trip and you get to have some solo time. I’d love to get to that point some time in the future…a trip just for ME 🙂 But for now, it’s all about being chained to our 3 kids…oh well! I’ll just have to live vicariously through your adventures (any more Argentina pics?). Meanwhile, this sorbet looks lovely, Must taste good, too, with the Cointreau. Hope you have a great weekend, Jean! What a wild adventure they had! This sorbet would be a sweet ending to a harrowing trip. This is such a great welcoming surprise. My hubby will be coming home soon, not from a camping trip however but a business trip. If yours were adventure stories and excitement and adrenaline. Mine would be boring stuff and scientific hypothesis and medical jargon…But there is nothing a fruity sorbet can make unenjoyable….Thanks! “Let me in little pig or I’ll huff and I’ll puff and I’ll blow your house” and “Not by the hair of my chinny chin chin” – are Tiffany’s lines when we read the Three little pigs story. Your husband is an adventurous one. 🙂 I am hoping to make this soon. My kids and husband LOVES pineapple and this sounds so easy to make!!! Maybe I’ll do one pineapple one. Thanks for sharing. SO happy to try this!!! Your analogy of the three little pigs made me smile 🙂 Even at the beach, we’ve had the desert winds kicking up at night – very strange. Another story to add to the campfire tales, and sounds like they were glad to be home and greeted with such a civilized treat! 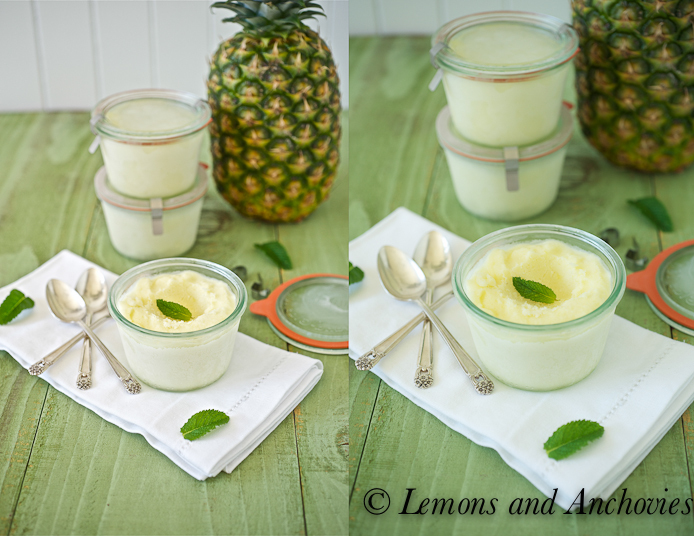 When I get settled in, I’m definitely making this refreshing sorbet – tropical flavors are my fave! Lovely design on the silver, btw. Ooooh! Pineapple sorbet! I’m happy that my kids prefer fruit sorbets to sugary ice creams. Ten days with no hubby and kids? Sounds sinfully good! We survived a night in the desert with 30mph winds. Luckily with five of us crammed in the tent and the stakes the hubby carefully placed to secure us, we weren’t blown away. But gear left outside was blown all over – some water bottles were never found! I love the story!! I’m not much of a camper, and when I tell people I’m going “camping” they ask what kind of tent I use. I just laugh and say, “Oh… I don’t use a tent. We have a 24 foot RV (rented for the once very two years we would use it)”. They say that is not camping… I beg to differ!! It can’t take a bath, have to run a generator to dry and straighten my hair, can’t wash dishes easily without filling up the tank, etc. etc. etc. That’s definitely roughing it. Glad his trip was fun though! And I’m also glad you got some time to yourself. LOVE, LOVE LOVE this sorbet! I’ve not seen one with the addition of the banana. This is more like the resort Hawaii vacation!! I’ll take that one…!! What an awesome welcome-back dessert. Could anything be better?! Um – this sorbet looks so refreshing and tasty that my mouth is literally watering. I am a big fan of adding a few naughty drops of booze into desserts – this is clearly not your average sorbet. I’ve never thought of freezing my sorbet or ice cream in weck jars, but it’s such a good idea! Perfect portions. This sorbet looks delicious, and I love that you added bananas to the mix. Your photos are beautiful. Love the pineapple and banana combo! And a sorbet is such a refreshing treat on a hot summer day! I have a pineapple sitting on my counter right now… I know what I am going to do with the pineapple this afternoon 🙂 Thanks for sharing… can’t wait to have a fresh pineapple banana sorbet! Wow, that is some camping trip! I am sure your husband was delighted to return home to this lovely sorbet…delightful! Oh, what a wonderful and refreshing sorbet!! Love the combination of pineapple and banana 🙂 Thank you for sharing your family’s adventures!